Startups as well as hospitals and city governments are grappling with questions about safety — particularly the use of helmets. WASHINGTON — After electric scooters suddenly appeared on the streets of Los Angeles about a year ago, Dr. Lisa Dabby began receiving injured riders in the emergency room of UCLA’s Nethercutt Emergency Center. The sudden rise of scooter startups in cities across the U.S. has fueled optimism for a future of urban transportation with easier commutes and fewer cars. Last month, Bird, one of the biggest of the scooter startups, said it had already surpassed 10 million rides, and Lime, a rival to Bird, claimed more than 11.5 million rides on its shared bikes and scooters. But widespread adoption and few regulations have left scooter startups as well as hospitals and city governments to grapple with questions about safety — particularly the use of helmets. So far this year, at least two people have died as a result of injuries they sustained while riding scooters from the new rental companies. The scooters, which can be unlocked through a smartphone app and then left anywhere, can go up to 15 miles per hour and operate in 10 countries and more than 125 U.S. cities. Users must accept lengthy terms of service agreements that exempt scooter companies from legal liability if riders are hurt using them. There is also no national database tracking all scooter-related injuries, making it difficult to measure the total harm that’s occurred, though some initial research around scooter safety found relatively low injury rates. Dabby and her team at the UCLA Medical Center have started keeping their own records to share with city officials, as has the Santa Monica fire department. “We needed to start tracking these injuries because there was just so many coming in,” Dabby said. A quick Twitter search turns up no shortage of riders documenting their injuries. Counting patients who were hurt from crashing on scooters — as well as those who were crashed into by people on scooters — Dabby’s team recorded more than 200 scooter-related injuries since the beginning of June. She said in the summer months they were seeing up to seven scooter-related patients a day. And while she says the numbers slowly dropped as summer ended, the main issue comes down to the lack of helmet use. Dr. Oscar Guillamondegui, medical director of the trauma intensive care unit at Vanderbilt University Medical Center, said the lack of helmet use by scooter riders has led to serious injuries, including facial fractures and traumatic brain injuries. “Our conclusion is that every injury would be avoided by wearing a helmet,” Guillamondegui said. Doctors aren’t the only profession seeing an uptick in interest from scooter injuries. Lawyers are also seeing opportunities to represent hurt riders. A group of eight people recently filed a class-action lawsuit, accusing the scooter companies of “gross negligence,” and billboards from lawyers looking to represent injured riders are starting to pop up. Scooter startups have launched safety campaigns in an effort to get people to begin following their rules and wearing helmets while also arguing that focusing on scooter safety misses the broader impact of reducing reliance on automobiles. With scooters now littering some of their cities, local officials said they have been performing something of a balancing act — creating new regulations to make riders safer while still attracting startups they see as the future of urban transportation. Jon Larsen, director of Salt Lake City’s transportation division, said his team has been working closely with scooter vendors to raise awareness and promote safety. Last month, city staff joined representatives from Lime and Bird on downtown sidewalks to pass out helmets and safety leaflets. “We have actually been pushing the vendors pretty hard to really emphasize safety because it’s in their best interests, as well,” Larsen said. In September, ER doctors in Salt Lake City reported a 161 percent increase in scooter-related injuries. 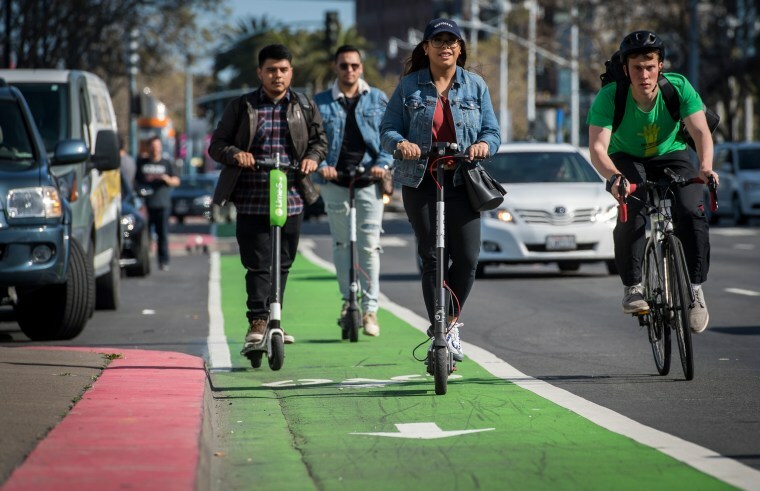 Still, Larsen said scooters have already done more good than harm by spurring important conversations and adding a new level of urgency to complete the city’s planned bike network. “You can just feel that momentum building for new ways of getting around and kind of re-thinking how the system works,” Larsen said. “For now, we’re treating scooters similar to bikes, but that may be something we’ll have to reevaluate in the coming months and years,” he said. Tariq Bokhari, a city council member in Charlotte, North Carolina, said he felt cities were limited in what kind of regulations they could introduce, even after witnessing a serious scooter injury himself. “I realized I could no more prevent that from happening than I could prevent somebody from looking at their phone while walking into a crosswalk into traffic,” Bokhari said. He said that with 800 scooters deployed in Charlotte, on average each is ridden about six times a day, which to him, indicates the city’s market can actually handle even more scooters. “The cities that are creating the best and most innovative environments for these types of alternative mobility companies to thrive, that’s where they are going to set up shop and really pilot some incredible new technology,” Bokhari said. Bokhari said Charlotte has yet to finalize its position on helmet safety regulations, but for him, the decision comes down to implementing laws that are actually enforceable — and laws that are in line with those that already exist for cyclists in the city. “Us asking our police officers to pull over and ticket anyone without a helmet, it’s just not a good use of their time,” he said. The scooter companies have also launched safety campaigns just as some cities have placed temporary bans on the devices as they determine how to regulate them. Person at work: "Friend of mine got hurt on one of those e-scooters"
Me: "Oh yeah? What happened?" Them: "Car ran a 4-way stop and he crashed the scooter into a parked car trying to not get ran over. Those things are so dangerous"
A spokesperson from Bird said safety is a top priority and that the company has given away more than 50,000 helmets. It also established a safety advisory board in August. And last week, the company introduced a new “Community Mode” feature, which allows anyone with the app to report damaged devices or irresponsible parking that may pose a danger. But Bird also sponsored a bill in California that reversed the original helmet requirement for people over the age of 18. Bird’s newly-introduced legislation permits non-minors to legally ride scooters without wearing helmets, consistent with rules already in place for cyclists. Governor Jerry Brown signed off on the new law in late September.